How Do You Write a Sincere Letter that Gets Noticed? Research the Member of Congress and research the District. For example, if you’re writing a letter about breast cancer research, you may want to know if the Member or their family has experience with cancer. Or, if you’re concerned about an agriculture bill, you may want to check if the District has a high number of farms. This research may help bolster your point of view. Shorter is better. You don’t have to write a long letter. One or two paragraphs is fine. Congressional staffers have a lot of mail to read, and if they want to know more, they can contact you. Include how it affects you or others from the District. If you’re writing about a disease, include, for example, information about the 10,000 other people in the District have the disease as well, or that 50 other workers will be hurt by an economic issue in your town. Share your point of view. Spend a few sentences explaining how the issue affects your life, family, community or workplace. Why is this so important to you? You don’t need to inform the staffer on the technical legislative aspects of the bill. They can research it themselves (and probably have already). Include a specific ask. What do you want Congress to do about the issue? Include a sentence that conveys an action item, such as holding a hearing on an issue, voting for or cosponsoring a bill (and include a bill number), or increasing funding for a program. If there isn’t a bill that addresses your issue, then suggest one! Members of Congress are open to introducing legislation that will improve the lives of their constituents. If you see a problem that can be fixed by Congress, then bring it to the staffer’s attention. For example, in September 2016, the House passed a bill that would prevent the federal government from mailing letters to people that included their Social Security numbers on the outside of envelopes and postcards where anyone can see them. Congressman Valadao introduced the bill, H.R. 3779, the Social Security Fraud Prevention Act of 2016, when one of his constituents explained to him at a Community Coffee Event he regularly hosts that her Social Security number could be seen in a letter she received from a federal agency. Don’t guilt the staffer or be condescending. 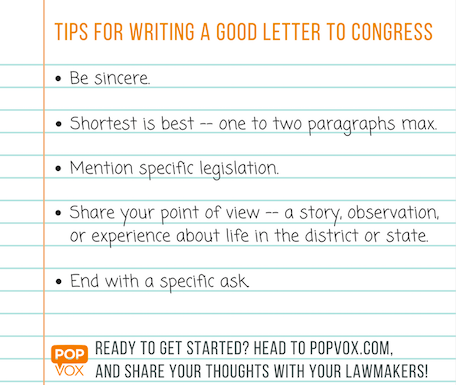 Congressional staffers are there to help constituents — and they understand that your issue is very important to you. There’s no need to say, “how would you feel if your kid/mom/grandma got stricken with _____.” It only takes one person to convince a lawmaker to sign on to a bill and kindness always goes far when trying to accomplish this. So speak up and share your voice!